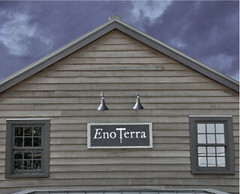 I haven’t been to Eno Terra in a while, so I’m really looking forward to their Thursday night dinner featuring the foods of Lombardia (part of their regional Italian series), where my grandmother was from. But Granny may not have eaten quite this well back in Villa Marioli, where life for her family was hardscrabble poor. The tiny hamlet, which had no commercial establishments, was demolished by a landslide many years ago (but long after my she emigrated), and the displaced citizenry moved to just outside Zavatorello, where some still reside. My mother grew up in the little house on Pine Street in Princeton where my grandmother and grandfather (he from Abruzzo) lived. North and south made a good marriage, and our family dinners always included, no matter what else there may have been, a pot of spaghetti sauce with pork chops and chicken for grandpa. I don’t remember much of the “what else,” except that the dessserts were lovely, ethereal dishes like floating islands and snowy white Bavarian creme. Turns out Granny cooked for wealthy families in her youth, and the cuisine was heavily influenced by nearby Austria and Switzerland. So, no southern Italian desserts for us! Braesola; duck/turkey/game terrine; sciatt, a buckwheat, tallegio and grappa fritter; tripe milenese. Extra crusty bread, minestrone soup, a pasta course of spinach gnocchi and gorgonzola (my mother made gnocci with her mother), a fish course of lake trout, asparagus and morels, veal osso bucco and risotto milenese (a family favorite and the first risotto I knew). From the Lake Como area comes miascia, a bread pudding with apples, pears, raisins and rosemary. And then there will be torrone (Mom loved good torrone, when she could find it; I’m dying to see if this might be housemade, maybe even with local honey…). The dinners are $80 plus tax and gratuity, and include wine parings. And of course, chef Chris Albrecht uses localy sourced ingredients as much as possible.